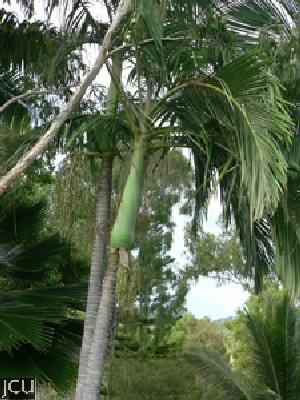 Endemic to the Northern Territory, this solitary palm has a slender, grey trunk that is slightly enlarged at the base, the rings are well spaced. Pinnate leaves forms a graceful arching crown, old leaves shed regularly. Fruit yellow to red to 1 cm long have a yellow cupule at the base. Cyclone resistant.